Rack Air Removal Unit SX 100-240V 50/60HZ for NetShelter 750mm enclosures. High-density equipment creates an environment where traditional air distribution methods are often not effective. 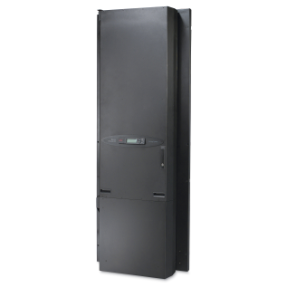 Densely packed enclosures can cause IT equipment to overheat, resulting in downtime. The Rack Air Removal Unit SX captures exhaust heat, returns the warm air to the plenum and eliminates hot spots from the data center. Through automatic fan speed control based upon temperature, the fans will self-adjust for optimal performance. With a unit-mounted LCD display, users can view temperatures at the rack, monitor alarm conditions and adjust unit set points. The integrated network management card allows for remote monitoring and control. This space-saving solution mounts to the back of either the NetShelter SX or VX enclosure, requiring zero U space.